On Friday the Suttons Primary School Choir visited the Romford Shopping Hall to sing Christmas carols to busy shoppers. During this time parents and carers were collecting money for a new multi-sports pitch to be built in the playground of the new school. Altogether we raised £390. As you may be aware, Suttons Primary is in the process of having a new school built. Year 4 have been given the honour to keep a close eye on the progress of the new building. Every week, year 4 have been taking pictures next to the building site to allow us to document this special time in Suttons Primary School history. Below are some of the photos taken so far in the past 3 weeks. See if you are able to spot the difference in each week! Before the building process started. On Thursday the Suttons Primary School Choir entertained busy Christmas shoppers at Lakeside Shopping Centre by singing a range of Christmas carols. An experienced they will never forget! 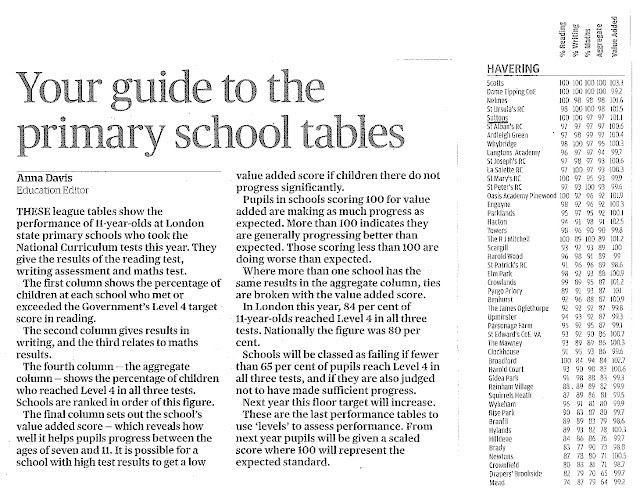 Primary League Tables - Well done Suttons! I wanted to take this opportunity to write to you and share our exciting news with you all. As lots of you will know, primary school league tables were released yesterday and published via the Evening Standard – see attached for Havering schools. You can also access the DfE Performance Tables via the school website – Learning/Assessment tabs. As a school we have continued year on year to improve our results. This year, based on these tables, Suttons Primary was the fifth (5th) highest performing school in Havering last year for pupils achieving Level 4 and above in all three areas of Reading, Writing and Maths. In fact only one of our children (equalling 3%) did not achieve this in Mathematics by only a couple of marks. Had this happened we would have been 2nd in Havering, only slightly behind our nearest neighbours Scotts Primary. As a school we are very proud of the achievements our pupils have made, which is only possible through good quality teaching and good quality learning opportunities. KS2 value added progress (Yr2 – Y6 progress) was above expected national levels in all subjects. 5 out of 6 disadvantaged pupils made and exceeded expected national progress in reading, writing & maths. Disadvantaged pupils had an average point score well above the national score for writing. The proportion of KS2 pupils, who attained at least a Level 4, was well above national figures for reading, writing & maths. The proportion of KS2 pupils, who attained at least a Level 5 was well above national figures for reading and maths and significantly above for writing. The proportion of KS1 pupils that attained, at least a Level 2B, was well above national figures in reading, writing & significantly above in mathematics. The proportion of KS1 pupils attaining a Level 3 or above was significantly above national figures in reading, writing and maths. The proportion of Year 1 pupils that exceeded the expected standard was significantly above national figures. During our science lessons, we have been discovering about magnetism, here are a few photos from our thorough investigations.